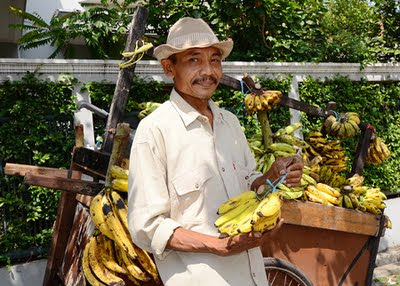 Sakir walks 10 kilometres everyday selling bananas in central Jakarta. "I've been selling bananas for 39 years. Bananas are what I know." The bananas are sold from a wooden cart. "I made the cart myself. But it's heavy and often breaks." Sakir sells over five different varieties of bananas. 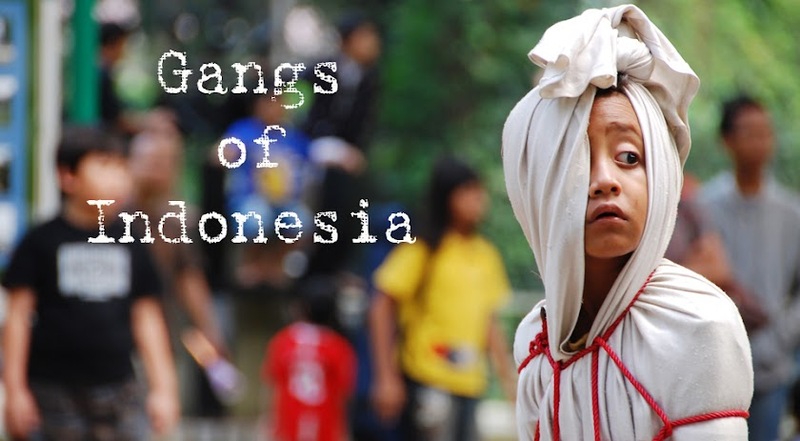 "The bananas from Sukabumi in West Java are the sweetest. 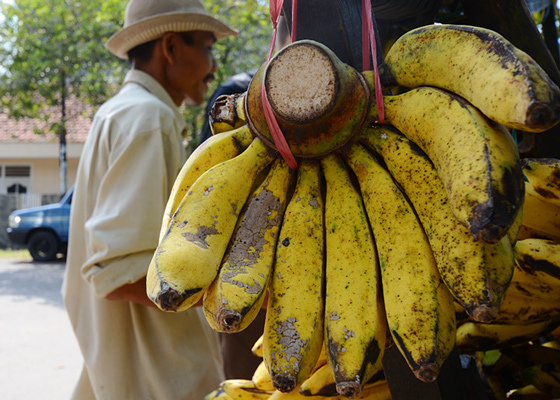 They're called pisang raja (king banana) and are the best-selling variety. 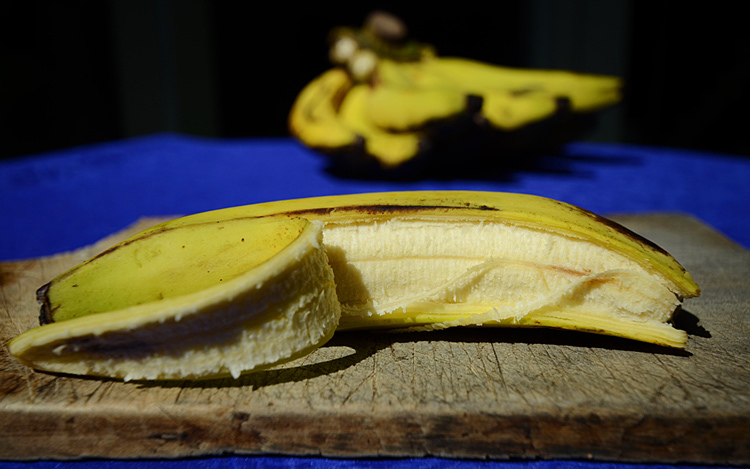 The bananas from Ambon are the most delicious. And these long green ones can't be eaten straight, they must be cooked first." Sakir buys his banana stock from the Palmerah market each morning, and sells an average of 25 bunches a day for Rp 7,000 ($0.80). 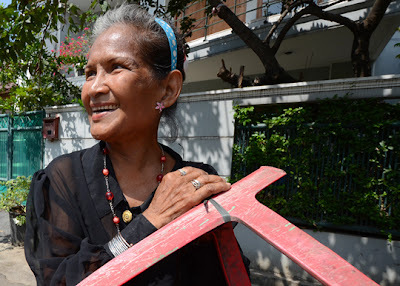 Svelte in long narrow batik, a grey-haired woman lingers by the banana cart listening to Sakir. She carries a red plastic stool and wears red lipstick. Tied to one leg of the stool is a bulging black plastic bag of bottles. She beams. Costume jewellery at her ears and wrists flashes in the sunlight. "I'm Ratu," she announces. Queen. "Do you know what I am?" she asks in English. "I'm a collector. I collect plastic rubbish from the street," she points to her bag of empty plastic water bottles. "Would you like a banana?" She laughs but shakes her head, choosing to refuse. Sakir is right. Most delicious: pisang ambon!